Day nurseries are often partners with schools in children's education, so teachers and helpers should try to employ hands-on teaching methods in all areas from science to sports. Kids, especially young ones, learn well when they are allowed to try things for themselves, rather than simply listening to another's explanation of how something works. Babies and young children naturally make use of all of their senses when exploring the world around them and although kids learn not to put everything that they touch into their mouths, they still benefit from experiencing new things as fully as possible. Teachers and helpers at childcare centres can help kids to not only enjoy their lessons, but actually internalise information more fully when they've participated in hands-on experiments. For example, kids could certainly learn about the differences in textures of assorted items by hearing detailed descriptions of them, but they'd have a much better sense of what the words meant if they were allowed to compare the feel of grainy salt, soft cotton, rough sandpaper, smooth leather, slippery oil, bumpy burlap, and sticky tape. By experiencing these things first hand, kids create reference points that they can use as needed in other life experiences and lessons. Anyone who has spent much time around children knows that many of their sentences begin with the words why, what, and how. Kids are naturally curious beings and this curiosity should be encouraged and cultivated, helping them to become lifelong learners. When feasible, it's good for kids to be able to take things apart to see how they work. Of course, this must be done with adult permission and supervision - no one wants to see children dismantling everything in the centre! Having a supply of toys that are designed to be built, broken down, and then rebuilt are terrific options for developing growing minds, and having child-sized tool sets on hand can help make the process easier. Owners of day nurseries can find a wonderful assortment of such products at both online and brick-and-mortar retailers specializing in educational toys, teacher supplies, and science based toys. 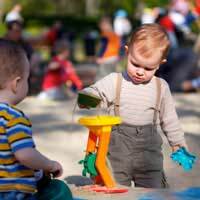 For the childcare environment, it's important to choose items that can be used repeatedly in order to make their use cost efficient. Science experiments for children do not have to be complicated, costly, or enormously time consuming. Basic microscopes are not expensive, yet can provide children with hours of entertainment and enormous educational benefits. Kids are often delighted to get a close up look at all sorts of common objects and substances, from leaves to strands of their own hair. Examining the properties of different items is interesting to children, who are naturally curious and observant. With the help of informed and enthusiastic staff members, kids at day nurseries can utilise any number of science toys, including those that allow them to build basic cameras, put together simple motors, assemble radios, or even make homemade ice cream! In the spirit of "doing" rather than merely "learning about," nurseries and other child care facilities should encourage kids to participate in a number of sports or active games. Daily exercise is vital for both physical and emotional health, and I think we'd all agree that it is far more enjoyable to play soccer than it is to read about it! Young children can be encouraged to run, skip, jump, and climb, while older kids can benefit from instruction and practice time for activities such as swimming, dance, golf, tennis, martial arts, or team sports. Any activities that get kids up and moving will benefit their growing bodies while improving their physical abilities and increasing their self-confidence. Today's kids spend a great deal of time at childcare centres, so it is important that their time is not wasted. By filling the days with fun and rewarding experiences, nursery owners can take pride in knowing that they are helping the next generation to be healthier, happier, and even smarter!